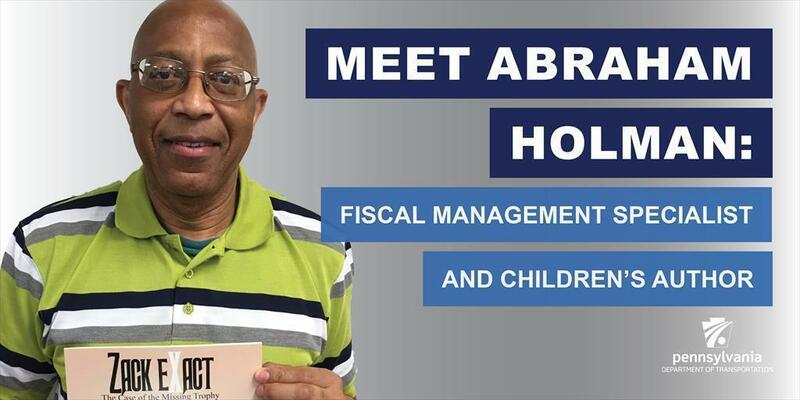 As a fiscal management specialist in PennDOT's Philadelphia-area office, Abraham Holman works with numbers all day long. His true passion, however, is words. Holman recently published his first children's book, "Zack Exact — The Case of the Missing Trophy," under the pen name, C.A. Samuel Holman. The book is about a teen detective tasked with solving the mysterious disappearance of the World Football Champion Cup. Holman came up with the idea during the 2014 World Cup. The storyline is just one part of an entire "Zack Exact" series created by Holman that challenges readers to solve mysteries using hidden clues. Holman, who has been with PennDOT since 2005, started writing around the same time. Before that he enjoyed making up stories to tell his daughter, nieces, and nephews. When Holman repeated his stories, his young audience would sometimes have to remind him of a part of the story that he forgot to repeat, which prompted Holman to start writing the stories down. His personal mission statement became "Write about it or it may not get written." Besides being an author, Holman is a veteran of the United States Navy, a graduate of Harcum College and a proud granddad. "Zack Exact – The Case of the Missing Trophy" is available for purchase at barnesandnoble.com and Amazon.